Timor-Leste’s first Adventure Race (2010) was an odd mix of dashes, dunks and dirt. But the one-day race offered sights, sounds and smells that were uniquely Timorese. Mallika Naguran reports from a dry, respectable distance. 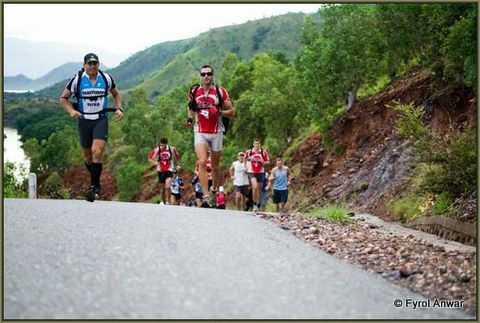 The Portugese team powered ahead on uphill Timor-Leste sections. Dili, 14 December 2010. Nobody had a clue what was to happen the next day; still they signed up. ID tags and brightly coloured tees bearing the words Adventure Race were collected. Timor’s first ever Amazing Race-copy event held on 12 December 2010 hinted at gritty ordeals, stomach-in-mouth action and jaw dropping surprises – all shrouded in secrecy. Around eight mixed gender (and age) teams were formed from Singapore, Australia and Timor-Leste. They were made up of expats, peacekeepers, the military, the police, and local residents hopeful of a slice of fame. Yasmine Khater, an Egyptian-Singaporean residing presently in Singapore, was a real sport. She was part of a four-women team from Singapore who travelled to the Far East especially for this event. The team represented the Gone Cyclin movement set up by Yasmine and Grace Chen - a charity in aid of poor Timorese through . From the word “Go!” at around 6am at the President’s Residential grounds, Yasmine and gang rushed past the other participating groups to reach the base of Christu Rei statue at the hillside where they were given the first clue – to ride the waves down at the coast with a local rowboat. Sounded easy enough. Still water (and Timorese boats) runs deep. As it turned out, the wooden boats were pretty local and built to accommodate Timorese sized folks. The simple and skinny fishing boats dipped lower into the sea bearing the weight of some contestants, and scooped up water. None of the teams made it across Aria Branca bay without getting wet. A few vessels capsized, to the dismay of the contestants and the amusement of onlookers. Lithe contestants like of the local police (Policia Nacional de Timor-Leste or PNT) and the local military (Falantil - Forcas de Defesa de Timor-Leste) out-rowed bulky bods such as the Portuguese GNR (Guarda Nacional Republicana). Still dripping wet on shore, competitors were handed the next clue: push a rock-laden drinks cart a few kilometres to Lahane Market. This was to give them an idea of what it was like to be a typical Timorese labourer. “That was easy!” exclaimed Yasmine, who had taken on the Tour de Timor challenge earlier in the year. Their next challenge was something not quite so easy though. After shuttling off into a microlet up to Dare hills, the next challenge awaited them: a Billy goat! ... but not everybody got it right. A few teams used the power of man over the logic of farm animals by tugging them hard with a rope (at the risk of being injured) or hoisting the goat over the shoulders. Yasmine and team let their new team member graze all down the hill, which gave them the much-needed breather. Needless to say the other teams raced past them. 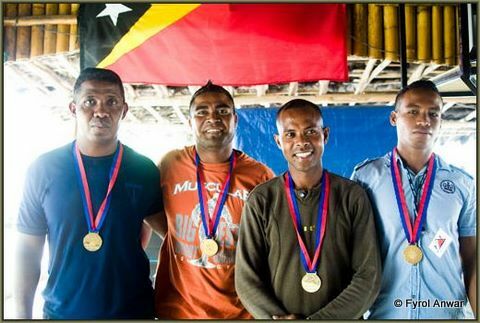 The Timorese team didn't win - but performed creditably and were very proud of their medals. Next, teams had to get on two local bikes and get to Comoro Bridge. Rickety as they were, the bikes posed technical challenges: wheels wobbled, handlebars hung loose and pegs came off. To organiser Sean Ferguson, this was just another typical day in under-developed Timor. “We wanted to show international participants what Dili was like on normal Sundays and how Timorese live. There were no road closures; they also explored remote places and dirt tracks,” he said. The goat was a tough act, but abseiling from the top of a bridge over a river proved to be nerve wrecking for nearly all. 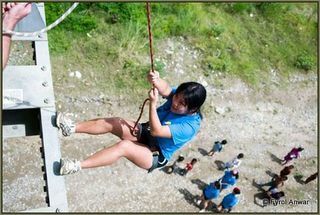 For Yasmine, this was the hardest as she had to overcome her fear of heights. She took half an hour to collect her nerves, get over the railings, and slowly descend over a 50 meter height, into a dry river bed. And she made it! (from left) Singapore's Victoria Chen, Yasmine Khater, Mai Ho and Grace Chen representing Gone Cyclin are proud of to be part of the first Timor-Leste Adventure Race. President Jose Ramos-Horta offiiciated the prize presentation ceremony. Finally, a jog in the sun down the Comoro river bed before turning to run along the sand, back towards the President’s Palace as finish line. The Portuguese GNR first touched the finish line after a gruelling 55km race and claimed the champion’s title in just six hours with teammates Monica Vieira, Marco Quintal, Alexandre Ramalheiro and Nelson Silva. 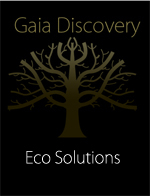 They also won US$1,600. Tied in second place were another GNR team and the Australian physiotherapy team who won $800 each. There was another tie in the event, with the PNTL team and the Portuguese expatriates taking third place, pocketing $400 each. Captain Pedro Nogueira, GNR Commander, was proud that his teams put up a good fight to clinch the title. “If there’s a competition, we will want to win it,” he said, adding that the prize money will be partly donated in aid of the Timorese children. Mai Ho and her team found the abseiling task the most tricky - but they completed it! Other teams were not as competitive. A group of Australians from Darwin thought it was a good idea to explore a new territory by visiting Timor-Leste at the time of the race and participating in it. “We had a good glimpse of Timorese life as we went up the hills and saw how the villagers lived. It is beautiful and cool up in the mountains,” said Mal Hingston, a mechanical engineer. But they were not really in the running. “Our kayak capsized, the pedal bikes fell apart, the microlet broke down going up the hill so we had to push it up then we had to drag out goat down – we thought it nearly died! But it was all good fun!” he laughed. Photography by Fyrol Anwar of Fyrol Photography. Video filming and editing by Mallika Naguran.